Our Worthy Warden, Sir Knight Tony Hocker stands to the left of our council’s newest Sir Knights, Neal Cullen, Ed Welsh, Jim Cosgrove and Mike Walsh. We are very happy to announce that four of our council members were elevated to Fourth Degree Knights of Columbus on Sunday. The Fourth Degree is the patriotic degree of the KofC, tasked with fostering a spirit of patriotism by promoting responsible citizenship and a love of and loyalty to the United States of America. Congratulations to Council Grand Knight Jim Cosgrove, Deputy Grand Knight Mike Walsh, Financial Secretary Neal Cullen and Treasurer Ed Welsh. The investiture ceremony was held at the Crown Plaza in Cherry Hill, NJ and welcomed nearly 300 new Fourth Degree Knights. All told, more than 600 Sir Knights and Ladies attended the event. The most notable members of the Fourth Degree, the Color Corps, is an elective membership. Their distinctive presence in parades, wreath-laying ceremonies, confirmations and other Catholic functions is a visible reminder of the Fourth Degree’s service to the community. The Color Corps enters the gala. It was a packed house of nearly 600 with just shy of 300 new candidates. The dais was full of dignitaries. At the gala a table is kept empty for all men and women who gave their lives in service to their country. An excellent selfie by SK Neal Cullen and Lady Melissa. Lady Maryanne and SK Ed Welsh. Lady Jennifer ejoys the gala dinner with her husband SK Mike Walsh and SK Jim Cosgrove. Lady Lisa and SK George Hayes, our insurance field agent. 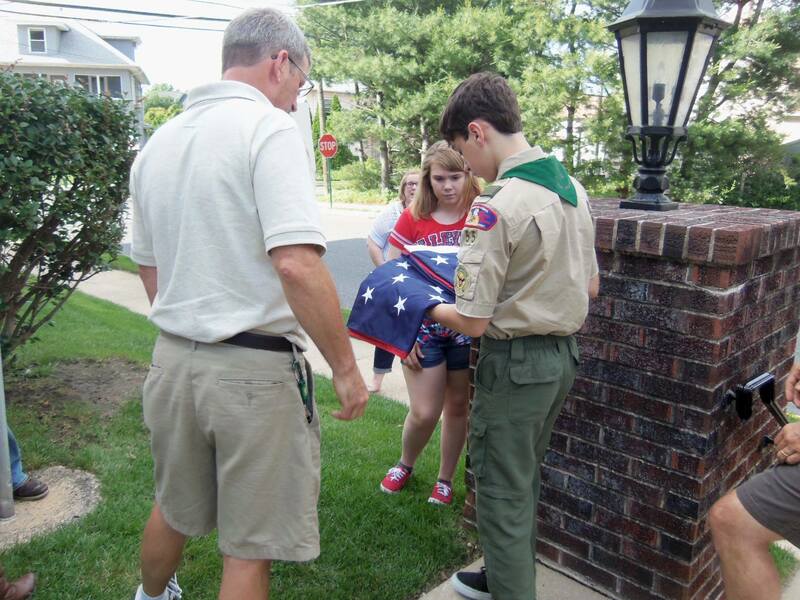 On Flag Day 2015, the Knights of Columbus Assumption Council 3397 held a special ceremony outside of the Church of St. Bridget Parish Center in Glassboro, N.J. In attendance were members of Assumption Council 3397, Saint Bridget Pastor Father Matthew Weber and many parishioners. Knights and parishioners of Saint Bridget’s gather at the Parish Center for the Flag Day ceremony. Grand Knight Ray Iacovone raises the flag during the ceremony. Father Matthew Weber offers a prayer at the close of the ceremony. Flag Day holds a special honor to the Knights of Columbus who, in addition to their many civic and social projects, work to cultivate pride in United States patriotism. From the discovery to the renewal of our nation, civic leaders have often remarked that freedoms come through the Grace of God – that civic duties and religious values are inextricably linked. In 1492, Christopher Columbus, namesake of the Knights, performed his civic and religious duties, as he would have understood them, when he left Spain for the New World. Our Founding Fathers expressed the Rights of Man as no less than a gift granted by our Creator when they established the United States of America in 1776. In 1863, Abraham Lincoln’s address at Gettysburg was just as explicit. In his desire to heal a country divided by war, Lincoln spoke the words “this nation under God shall have a new birth of freedom. The Knights of Columbus are proud to continue to uphold and promote both American and religious values in these complex times for our nation. Father Matthew Weber dedicates the new flag. 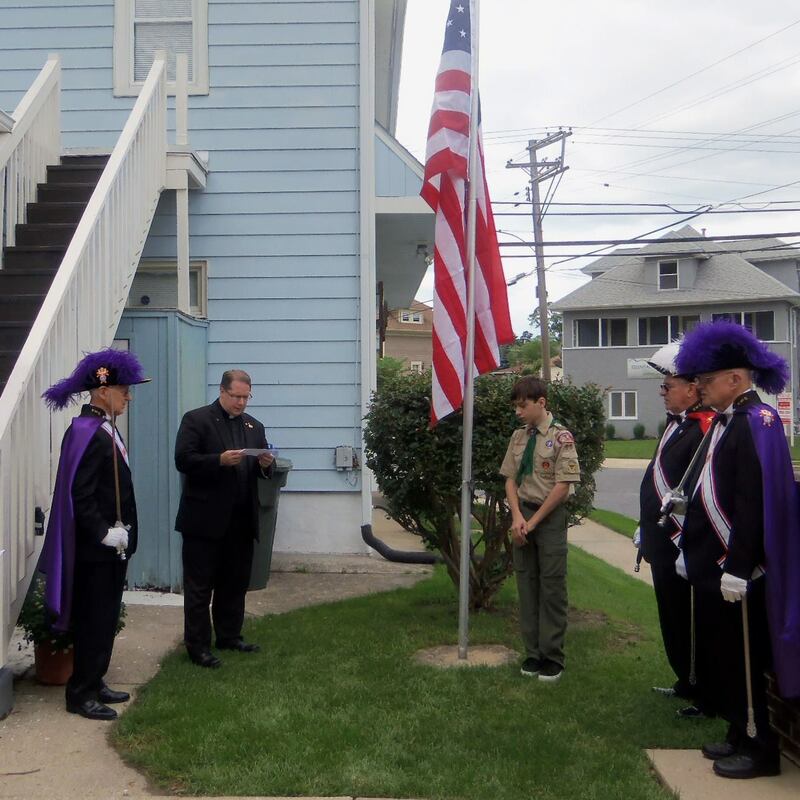 On June 14, 2014, in observation of Flag Day, the Knights of Columbus Assumption Council 3397 held a special ceremony outside of the Church of St. Bridget Parish Center in Glassboro, N.J. to rededicate the flag pole and raise a new flag. 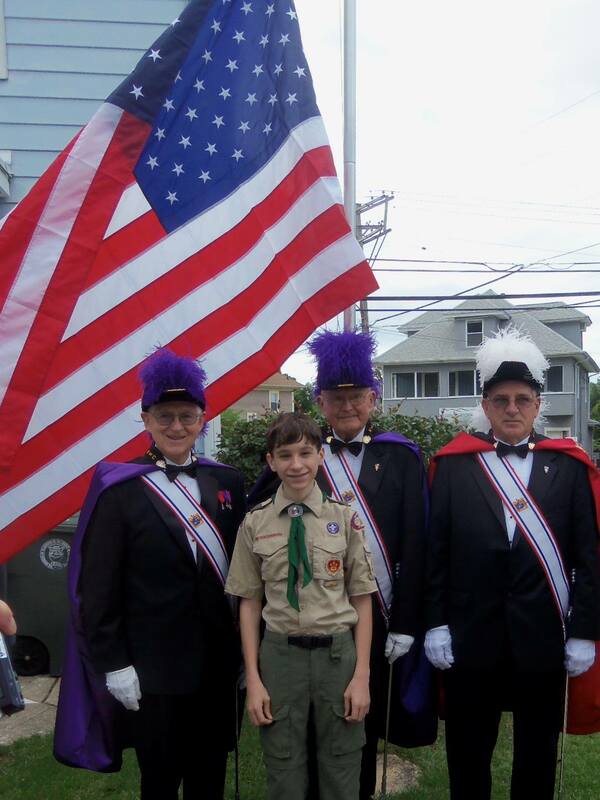 In attendance were members of Assumption Council 3397, Saint Bridget Pastor Father Matthew Weber along with many parishioners, Eagle Scout Thomas Seddon of Glassboro, and members of the Knights of Columbus Color Corps from Archbishop C.J. Damiano, Bishop James Schad, and Bishop Eustace Assemblies. 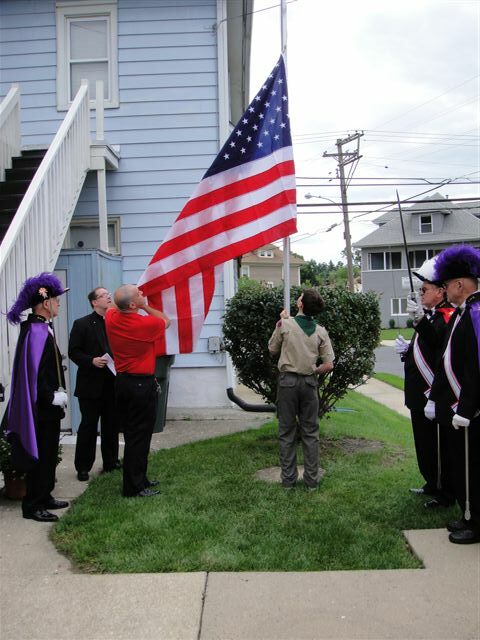 Grand Knight Ray Iacovone assists in the raising of the flag. Flag Day holds a special honor to the Knights of Columbus who, in addition to their many civic and social projects, work to cultivate pride in United States patriotism. 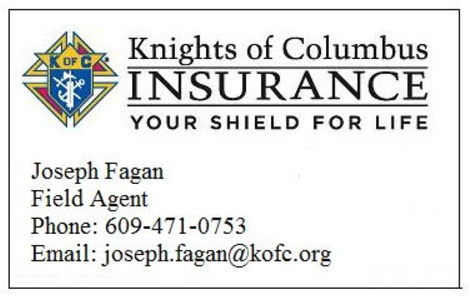 In that vein, the Knights of Columbus helped lead the charge to add “under God” to the Pledge of Allegiance, which occurred 60 years ago on Flag Day, June 14, 1954. From the discovery to the renewal of our nation, civic leaders have often remarked that freedoms come through the Grace of God – that civic duties and religious values are inextricably linked.